Mexico is our first stop on this wonderful 10th Lord of Miracles Tour in Honor of Guru Ram Das. Lying just south of the USA and north of Central America, Mexico has always been a land of gracious hospitality, warm sunny climes and a strong Sikh presence. 100 million Mexicans are devoted and dedicated, kind and smiling, and most of all welcoming. For the past 35 years, the presence of Shabd Guru and the teachings of kundalini yoga have affected all levels of Mexican society. The rich cultural and religious heritage of the Sikhs who have settled there has brought a great contribution to the fabric of Mexican life. The incredible plethora of Kundalini Yoga teachers and Yogi Bhajan's teachings has brought a great relief from the stress of the times, especially in Mexico City, perhaps the largest city in the world with more than 28 million souls. Every year the Mexico City sangat has a Guru Ram Das weekend in the end of September. It is a weekend of sadhana, kirtan, gurdwara, Sikh studies, and lots of kundalini yoga. It is only natural that the 10th Lord of Miracles Tour in Honor of Guru Ram Das was inaugurated this year in Mexico City. The following are some wonderful pictures that highlight our brief stay in Mexico. I am sure you will get the feel of this great event. Just remember to look at the bright faces of the Mexicans. You would think they are born Punjabis! Gurubachan Singh teaching a class on the importance of consciousness of breath, followed by an inspired Q&A session with Saibhang Singh and Ram Das Singh. The Mexico City gurdwara is so beautiful. You can see in this photo how beautifully they decorate and how the many windows let in lots of green light with a beautiful backdrop. You'd never guess that this beautiful property sits right in the middle of the hustle of the city. Gurubachan Singh taught an evening class including Guru Ram Das mantras and breathing techniques followed by a half hour of bhangra! The langar was delicious, as you could imagine. It was lovingly prepared with fresh ingredients, zest and simplicity. A hungry group tries to beat the rush at the langar hall of the festival. Ragi's from Dallas were flown in for the festival. They held the space of the gurdwara with their beautiful and inspiring kirtan. The Akhand Path, read in Spanish, lead to a beautiful bhog ceremony to complete the celebration of Guru Ram Das' birthday. 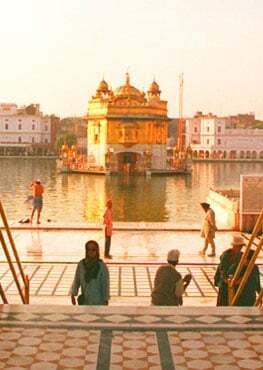 Gursikhs bow reverently to the Siri Guru Granth Sahib as the Guru's procession passes en route to the gurudwara. How bright and beautiful are these two little Mexican girls! The sangat was very happy to have us with them and asked us to speak about our experience of Sikhism. Nestled in the heart of a valley in Ecuador, there is a small city called Cuenca. Running through the city are four rivers that bring the energy from the mountains and spread it out throughout the city. Next to one of these rivers, the Tomebamba, is Sat Nam - a small yoga studio hidden away in the plaza. This yoga studio is the center of the teachings of kundalini yoga and where the house of Guru Ram Das resides. I met this community in March, when I came to visit South America for the first time in my life. Sat Nam was founded by a beautiful woman named JaapHari (Clara Valdivieso). JaapHari'sfamily are prominent members of both the business and yoga environment. With her radiant light, never-ending love, and tenacious determination, the sangat in Cuenca has grown exponentially. The community, though small, is one with great determination to connect, grow, and heal within themselves. In January they started doing a community sadhana at 4:00 a.m. which has continued every day since. The small studio can accommodate 18 comfortably and is packed each morning with 15-23 people faithfully recitingJaapJi, practicing yoga, and meditating together. This year, in honor of Guru Ram Das's birthday, the sangat did their second annual akand path, completely in Spanish. For four days and four nights the whole community read the Guru with such love and devotion that it brought tears to my eyes. 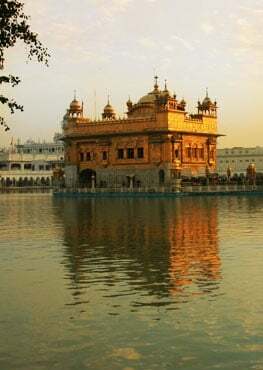 I have only felt that kind ofenergy created in one other place in my life, the Harimander Sahib. As they read,they cried from the way the Guru spoke to them. This experience was so powerful for everyone involved,andhas now become a yearly tradition. An akand path to celebrate Guru Ram Das's birthday. These changes are not only seen in the immediate sangat but in the conservative Catholic community as well. When Guru Bachan Singh came to give the Lord of Miracles tour this year, 150 people attended. Out of those people, 100 had never meditated or even heard of Guru Ram Das. I was honored to sit next to Guru Bachan as he taught the class. I was able to witness first hand how the energy and love of Guru Ram Das transformed and changed the people in the room. I can say that every single person in attendance left glowing smiles. Sat Jagat Singh, one of my best friends in Cuenca said it perfectly, "it was one of the best experiences of my life." The changes in Cuenca may seem small but they have had a monumental effect on this growing sangat. Guru Ram Das's energy has healed, and is continuously healing this community. It has been my joy to see this change and do my part to help facilitate it. Happiness looks the same in any language. When we met Cuencans in their native dress, we were mutually impressed. The energy in this beautiful cathedral was breathtaking. We had to take a moment to sit and meditate. Class focused on the importance of conscious breathing and applying it in everyday life. These breath techniques bring stress relief and when the gurbani is played we are taken to an even higher state of ecstasy. The meditations were accompanied by mantras of "Har Har", "Guru Guru Wahe Guru Guru Ram Das Guru", and several more by Nirinjan Kaur, Snatam Kaur, and Sat Kiran Kaur. Meditation sessions, above and below. One of the local members of the sangat shows us her photo of the Siri Singh Sahib Ji (Yogi Bhajan). A typical 'after class picture' with S.S. Gurubachn Singh (center) and the family of Jap Hari Kaur (2nd from right). In South America it is common for the whole family to participate together in an event or experience. The culture is far less individualistic than North American culture. R to L: Ram Das Singh, Jap Hari Kaur and S.S. Gurubachan Singh stand for a picture together with a local in Cuenca's handicraft market. R to L: Amrit Kaur, S.S. Gurubachan Singh and Dharam Dian meeting before the class in Cuenca. After class, there was so much gratitude; the greetings and questions lasted almost as long as the class.